Mexico City –- Mexico’s agriculture and fishing industries called on the Senate Monday to hold off on ratifying the free trade agreement with Peru until a better deal can be negotiated. Five organizations took out ads in different newspapers timed to coincide with Peruvian President-elect Ollanta Humala’s visit to Mexico. The groups said they did not oppose the free trade agreement but asked senators to "take into account the high effects on sensitive products" that the accord would have. 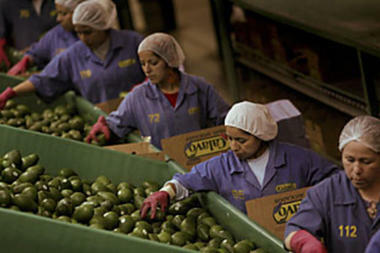 Mexico and Peru signed the free trade agreement on April 6 in Lima, but the Senate must still ratify the accord. "The agricultural industry has been the big loser in the opening of Mexico to trade, with two decades of rising trade deficits," the groups said. Economy Secretary Bruno Ferrari, whose Cabinet department broke off talks with agricultural and fishing organizations, acted unilaterally in signing the agreement with Peru, the groups said. "Sensitive products," such as chilies, beans, bananas, onions, avocados, oranges, lemons, grapefruit, potatoes, mangos, garlic, grapes and several seafood items, should be excluded from the agreement, the organizations said. These products generate "nearly 1 million jobs" and provide work to "more than 400,000 producers," whose output totals 78 billion pesos ($6.66 billion), or 17 percent of Mexico’s agricultural gross domestic product, the groups said. The message was signed by the National Peasants Confederation, or CNC, the National Ranchers Organization, or CNG, the National Rural Property Owners Confederation, or CNPR, the National Association of Agricultural Development Secretaries, or ANSDA, and the National Agricultural Council, or CNA. Trade between Mexico and Peru amounted to $1.31 billion in 2010, according to Bank of Mexico figures, while Mexican firms have invested $3.7 billion in the Andean nation. Mexico’s total foreign trade is around $620 billion annually.